Check out this poster by Khatt Phatt. Soon, this thoughtful style of design will become the form of propaganda that defines our younger generations. In the age of #TimesUp, #MeToo and #BlackLivesMatter, consumers are extremely concerned with how brands impact positive change and promise philanthropic opportunities for the buyer. This means design that mimics humility and honestly, such as handwritten fonts and visual storytelling mediums like illustration, will resurface this year. On top of that, we can expect more airy and delicate designs. According to 99Designs, this new take on illustrative design is “heavily influenced by botanical and natural elements – more feminine and appealing to a more innocent and childlike part of us all.” Makes sense when it’s time to sell the legitimacy, intention and trustworthiness of a brand. Although consumers welcome AI and mobile technology advancements with open arms, we are also expecting the brand identity and content to have a human consciousness, reflecting our behaviors and values more than ever. 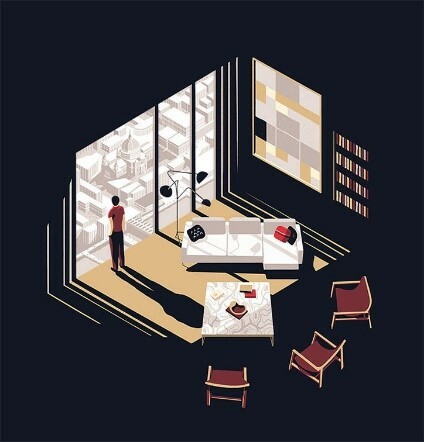 Check out this isometric design by Tom Haugomat. This 3D drawing style in a 2D format does the world-building and storytelling for us, leaving no room for assumptions. Buyers come into the business marketplaces represented by these illustrations with a concluded idea of what their experience will look, sound, feel, and in some cases, taste like. Consumers are much more inclined to trust brands that take the isometric approach, also crediting them to practicality for positioning their brand imagery to ideal experiences. And the demand for utopic 3D illustration does not stop at service marketing. Product, social and web design is expected to shift to represent the notion of real-life fantasy. On the other hand, this means bright colors and gradients, collages and asymmetrical layouts – designs that trigger all of the senses at once. It seems consumers may be looking for a utopic take on reality, positioning their favorite wines, blogs and clothing brands with those that promise the most surreal, euphoric experiences. That includes design that requires more consumer interaction, such as turning your head side-to-side to read as a result of mixing horizontal and vertical text or triggering cognitive memory as a result of using textures such as fur or water droplets. Check out this advertisement for Issey Miyake’s Pleats Please clothing line. Which graphic design trend are you most excited to see? Let us know in the comments below, and click here to learn more about Three Box’s creative services!